During a time they would much rather forget, the Duncan Aviation Fuel Team spent hours preparing for the removal of every Falcon wing plank by manually creating cardboard cutouts that matched the unique screw patterns of each section. One by one the screws were removed from underneath the wing and placed in the corresponding hole of the cardboard. This individual attention continued as hand tools were used to remove the sealant one screw at a time. It is very important to keep the screws in order so they are put back in the exact position they were removed from. If they are not, the nutplates on the inside of wing can be damaged. If this happens, the wing plank has to come off again to repair it. 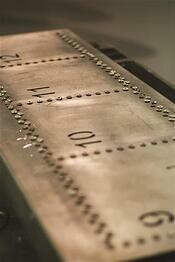 Each time an aircraft needed a plank removed, a new set of cardboard sections were prepared. The process worked, but not without some headaches and mishaps. The cardboard planks were often jostled or bumped causing the screws to spill, resulting in more time spent consulting airframe manuals and sorting them out. Born out of the frustration of doing the same activity over and over again for hours at a time, a set of aluminum screw boards was fabricated for each Falcon aircraft model, eliminating hours of prep time. The largest reduction of labor hours was realized during the cleaning phase. After much discussion, research and testing, a stainless steel tank was purchased to submerge the boards in solvent. After soaking for a couple of nights and being rinsed with water, the screws come out looking like new. The boards and soaking tank took what was once a 40+ labor hour job down to three hours. Now, operators down for fuel leaks or a fuel tank inspection can potentially be back in the air in a matter of days. The Primary Driving Force Of New Inventions Is Need. Duncan Aviation technicians are some of the most forward-thinking aviation professionals. Their desire to make their work environment safer, time more efficient, and provide a better service has produced tooling, fixtures and maintenance procedures that have fulfilled some very real needs. Read more examples of how this innovation affects work for Duncan Aviation customers and team members in the Spring 2017 Duncan Debrief.